Cancer is one of the leading causes of death for women. 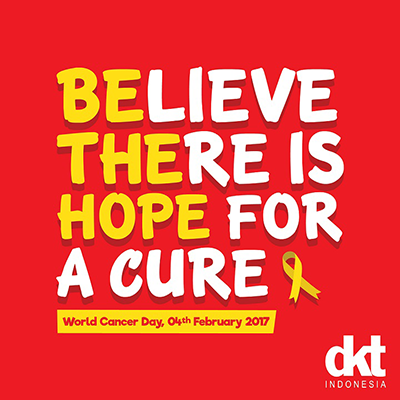 Breast, cervical, and ovarian cancers are the most common among Indonesian women. Many widespread myths claim that the use of long-term hormonal contraceptives increase the cancer risk. Is it true?. Family Planning & Reproductive Health Deputy GM of DKT Indonesia who also manages the Andalan Contraceptives, Basuki Dwi Harjanto explained, “Myths on the effect of hormonal contraceptives to the increase of cancer risk are not entirely true. There has been no adequate study to explain such claim. Basically, a woman’s risk of developing the cancer will increase if she has a family history of cancer and does not maintain a healthy lifestyle”. “We are proud to be supported by the Ministry of Health, the Indonesia’s National Family Planning Coordinating Board (BKKBN), National AIDS Comission (KPAN), Indonesian Midwives Association (IBI), and other governmental institutions as we work towards our mutual goals set by Family Planning 2020,” says Juan Enrique Garcia, DKT Indonesia Country Director. “Studies show that the use of contraceptives will improve a woman’s health because they may reduce risks of ovarian cancer, acne, endometriosis, and help to diminish anemia” Basuki added. Woman’s high estrogen and progestin hormone level may indeed initiate the growth of cancerous cells. However, cancer is triggered by complex and multi factors. They will not develop from one factor only. In addition, high-estrogen-content hormonal contraceptives have no longer been marketed since 1980s. Therefore, widely marketed hormonal contraceptives nowadays contain a low level of hormone and they are safe to use. If you intend to take a hormonal contraceptive in pills, choose contraceptive pills which contain a low estrogen and progestin level such as Andalan Laktasi which safe for breastfeeding mothers and Andalan FE for an active woman to help you substitute the iron deficiency during menstruation period. The ideal content of estrogen is around 0.03 mg Ethinylestradiol and Progrestin is about 0.15 mg levonorgestrel or 0.5 mg linestrenol. If you choose IUD, take non-hormonal IUD such as IUD Andalan TCu 380A Safe Load or IUD Silverline. In addition to be effective and efficient, a long-term contraceptive like IUD does not affect any breast milk production and quality. Thus, it is safe for breastfeeding mothers. Understand first your body character before you choose your contraceptive and do not forget your body’s hormonal structure. “Principally, the contraceptives effect is different for each woman. Thus, to know the most suitable contraceptive method, you have to consult your obgyn or midwife first. They may help you to decide your medical eligibility criteria for contraception based on your genetic factor and lifestyle” Basuki wrapped up the conversation.